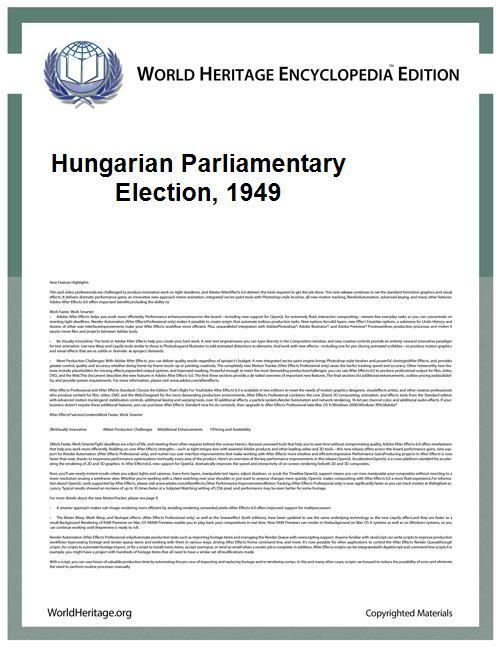 Parliamentary elections were held in Hungary on 15 May 1949. The Hungarian Independent People's Front, an umbrella group created that February to replace the National Independence Front and led by the Hungarian Working People's Party (which was formed in June 1948 through a merger of the Hungarian Communist Party and the Social Democratic Party), but also including the remaining four non-communist parties, ran a single list of candidates drafted by the Communists and espousing a common programme. With all organised political opposition entirely destroyed, and the Communists dropping all pretense of democracy, the Front won 95.6% of the vote, presaging the result of elections through 1990. 71 (17.7%) elected deputies were female, up from 22 (5.4%) elected in 1947. Some 71% of those elected belonged to the Hungarian Workers' Party, and a similar proportion were workers or peasants. The election came in a year of the Communists' tying up loose ends in their bid for total power. The second half of 1948 had been the turning point. In June, shortly after the forced merger of the Communists and Social Democrats, President Zoltán Tildy, a Smallholder, was replaced by Social Democrat-turned-Communist Árpád Szakasits. In December, Prime Minister Lajos Dinnyés was replaced by fellow Smallholder István Dobi, who made no secret of his sympathies with the Communists. On 1 January 1949, Hungary was a founding member of Comecon. On 6 February, Cardinal József Mindszenty, leader of Hungarian Catholics and a prime opponent of Communism, was sentenced to life imprisonment. The Independence Front was formed in February and by the time of its March congress, it had become clear that it was to act as a vehicle for destroying rather than bringing together the main parties; many non-communist right-wingers had already been forced to resign in the summer of 1948. Three months after the election, a new constitution proclaiming Hungary a People's Republic and enshrining the principle of one-party rule was adopted. Schools were nationalised, collectivisation was launched, the bureaucracy was purged, the independent press was destroyed, and the last remnants of free enterprise were eliminated. Also, László Rajk, General Secretary of the Independence Front and Foreign Minister, who the day after the election was the main speaker at a mass demonstration where he condemned Titoist "running dogs of imperialism", praised the "brilliant strategy" of the "great leader of the peace camp", Stalin, and the "wise leadership" of Stalin's best Hungarian pupil, Comrade Rákosi, was himself arrested two weeks later and executed in October following a show trial. A nominally coalition government was formed, with the Smallholders receiving the Ministries of Trade and Religion and Education, and the National Peasants Party receiving Agriculture and Construction. After the election, the Front's local committees dissolved themselves, and with them the National Peasant and Independent Smallholder local organs, although no law or ordinance was ever passed abolishing them.